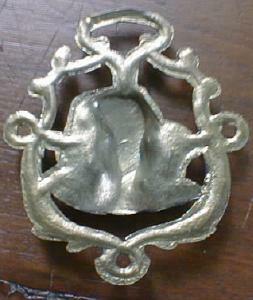 Offering this solid brass horse rosette with an unusual design. 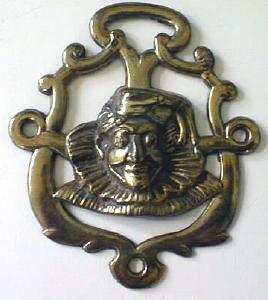 Inside a scrolled frame is the head of a man dressed in a ruffled collar and a cossack style hat. Measures 3 3/4" tall x 3 1/4" wide, good condition, no cracks or chips. No markings as to maker but is probably European. Age is unknown, although it is not brand new. A great addition to your collection! 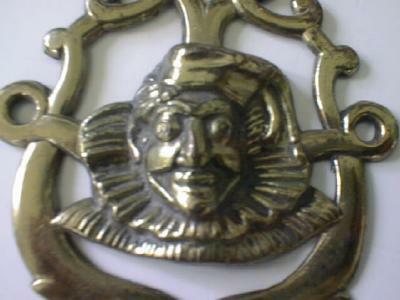 Items Similar To "Brass Horse Rosette Unusual Clown Design"